Acute suppurative thyroiditis (AST) is a rare disorder. Only 500 cases have been reported in the literature till date. Ultrasonography of the thyroid with fine needle aspiration cytology (FNAC) may help in the early diagnosis. ,, The smears from the thyroid aspirates are predominated by sheets of polymorphonuclear cells. ,,, Changes in the follicular epithelial cells have not been emphasized in the literature. In present article, a case of AST is presented where, other than inflammatory cells, the follicular epithelial cells also showed prominent nuclear changes, simulating a malignant lesion. A 53-year-old known diabetic and hypertensive (both controlled adequately) lady presented with sudden (painful) enlargement of the swelling over the right lobe of the thyroid. She had a small 2-cm diameter nodule over the same location for the last 6 years and she had been euthyroid. On physical examination, the goiter was tender and firm. Her pulse rate was 110/min, blood pressure was 160/90, blood sugar was raised and biochemical studies revealed hyperthyroid state with high T3, T4 and thyroid-stimulating hormone levels. ECG revealed left ventricular hypertrophy and sinus tachycardia. Chest radiograph was within normal limits, except enlarged cardiac shadow. Raised erythrocyte sediment rate and significant neutrophilic leukocytosis were present. Ultrasonography revealed enlarged right lobe (5 cm × 5 cm × 4 cm) and isthmus (2 cm diameter) of the thyroid with an impression of a heterogeneous, lobulated, necrotic, cystic focally calcified and vascular lesion, possibly necrotic colloid goiter. FNAC from the swelling yielded pus mixed with blood. Microscopic examination revealed features of acute suppurative inflammation with sheets of polymorphs admixed with macrophages, plasma cells and many benign-looking thyroid follicular cells. Necrosis was absent in spite of plenty of acute inflammatory cells and stromal/capillary fragments. Thick colloid globules were present with many multinucleated giant cells [Figure 1]c and d and foci of microcalcifications. The follicular cells showed columnar cell changes with abundant finely granular cytoplasm [Figure 1]a, nuclear overlapping and pleomorphism [Figure 1]b, e and f, bi- and multinucleation [Figure 1]b and e, coarsening of chromatin [Figure 1]e-i and prominent intranuclear inclusions well appreciable with May Grünwald Giemsa (MGG)- [Figure 1]e and f as well as Papanicolaou (Pap) [[Figure 1]g-i]-stained smears, but no nuclear clearing or grooves. No infective organism was identified and the culture was negative. Therefore, a diagnosis of thyroid abscess was offered and, after the acute episode, a histopathological follow-up was suggested. The patient responded well to conservative therapy with broad-spectrum antibiotics. She is being followed-up for the last 2 years. Follow-up radioisotope scans and hormone levels do not show any abnormality. Immunocompromised adults are more susceptible to opportunistic infections of the thyroid gland, which might be applicable to the present case where the lady was a known diabetic for the last 7 years and had a pre-existing goiter for the last 6 years. In this case also, the predominant cell populations were polymorphs and macrophages, but no necrosis. Thick colloid globules and multinucleated giant cells were frequent findings. Calcification could be due to dystrophic changes in an old colloid cyst. The unique findings in this case were columnar cell morphology of the follicular cells with abundant finely granular cytoplasm, nuclear overlapping and pleomorphism, bi- and multinucleation, coarsening of chromatin and well-appreciable prominent intranuclear inclusions. Phagocytosis of the polymorphs by giant cells was also appreciable [Figure 1]c, which is also unusual. However, no nuclear clearing or grooves were noted to suggest papillary carcinoma. The possibility of occult malignancy could only be excluded after histology. However, the patient responded well to conservative therapy and follow-up radioisotope scans and hormone levels did not show any abnormality after 2 years of the episode. Well-appreciable prominent intranuclear inclusions in thyroid abscess in the present case are just incidental findings, or it has some significance that is unclear till date and not mentioned in the literature. Cautious cytological scrutiny and study of more cases in the future are needed before drawing any conclusions. Ilyin A, Zhelonkina N, Severskaya N, Romanko S. Nonsurgical management of thyroid abscess with sonigraphically guided fine needle aspiration. J Clin Ultrasound 2007;35:333-7. Lin JD, Huang BY, Huang HS, Juang JH, Jeng LB. Ultrasonography and fine needle aspiration cytology of acute suppurative thyroiditis. Changgeng Yi Xue Za Zhi 1993;16:93-8. Singh SK, Agrawal JK, Kumar M, Shukla HS. 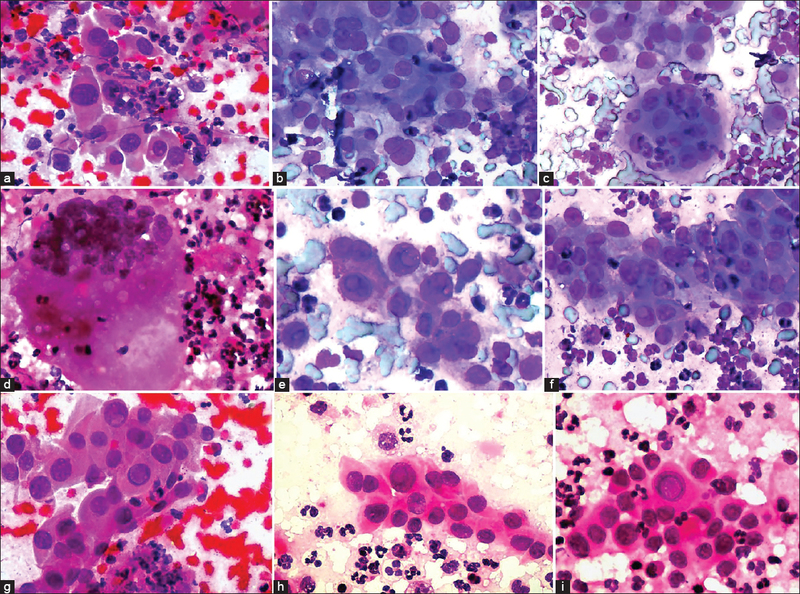 Fine needle aspiration cytology in the management of acute suppurative thyroiditis. Ear Nose Throat J 1994;73:415-7. Hong JT, Lee JH, Kim SH, Hong SB, Nam M, Kim YS, et al. Case of concurrent Riedel's thyroiditis, acute suppurative thyroiditis, and micropapillary carcinoma. Korean J Intern Med 2013;28:236-41. Gimondo P, Messina G, Gimondo S. Unusual case of acute suppurative thyroiditis. Minerva Med 1996;87:475-8. Schweitzer VG, Olson NR. Thyroid abscess. Otolaryngol Head Neck Surg 1981;89:226-9. Herndon MD, Christie DB, Ayoub MM, Duggan AD. Thyroid abscess: Case report and review of the literature. Am Surg 2007;73:725-8.